Three months of Bible readings based in the books of Genesis, Matthew and Acts. 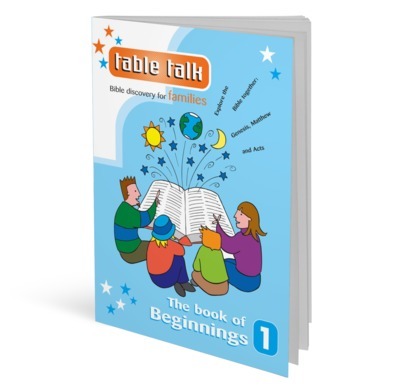 Issue One of Table Talk is called The Book of Beginnings. It contains three months of Bible readings based in the books of Genesis, Matthew and Acts. The pages are undated. It will help you explore the beginning of the universe, the beginning of the early church and the beginning of Jesus' life and teaching on earth. I have always wanted to read the bible as a family but never managed to maintain the children's interest and wondered how much they understood. this book is fantastic as the biblical explanations are excellent. The children and adults get to do activities not just simply read. For example this week my kids have had strips of paper with bible verses and have been trying to put them in order, they have also been acting out scenes. Great fun and a great way of remembering what you have learnt. Even my 13 year old joins in. I would thoroughly recommend it. I've looked at lots of resources for teaching our small Kids Church. We have found Table Talk enabled us to put together great lessons that are theologically sound, and often more in depth then many other resources. We combine 2 studies most weeks, our primary school age break off and look further at the lessons using the XTB studies while we do a related craft with the infants. This book might be fine for families who really do want to sit around the table and talk about the Bible. I was looking for bed-time Bible study for a 6 year-old. I later found that XTB was a better match for me. We have been using Table Talk for a couple of months now and it's working well for us with our 8 and 6 year old children. We particularly like the short practical exercises or personal questions that attract their attention when they otherwise are not always keen to listen. They are just the right length for us too, I'm just going to order the next book: Table Talk 2!